Cordoba Corporation is pleased to announce that President & CEO George L. Pla has written a book, Power Shift, How Latinos in California Transformed Politics in America, which has been published by Berkeley Public Policy Press. Power Shift was written after intense research and extensive oral interviews conducted for almost a decade. The book was co-authored by David R. Ayón, a Senior Strategist and Advisor to Latino Decisions, and Senior Fellow at the Center for the Study of Los Angeles. 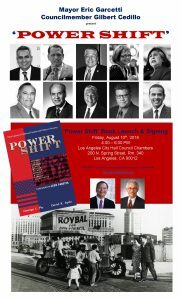 In celebration of the release of Power Shift, Los Angeles Mayor Eric Garcetti and Los Angeles City Council Member Gil Cedillo (CD 1) are hosting a Power Shift Book Launch and Signing on Friday, August 10, 2018 in the Los Angeles City Hall Council Chambers from 4:00 – 6:00 p.m. Messrs. Pla and Ayón will be in attendance, along with important community leaders featured in the book. 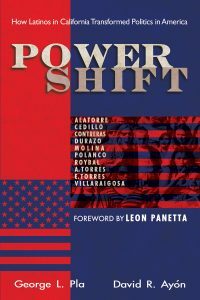 Power Shift recounts the origins and development of 10 Los Angeles Latino leaders who transformed politics and government, forging a progressive political tradition in the process. Challenging disadvantage and discrimination, these key figures integrated the Los Angeles City Council as well as school and county boards; established Latino collective political action in the state legislature and in Congress; restructured the US Census and how California’s electoral districts are drawn; and played major roles in reforming the US labor movement and US-Mexico relations. The authors’ objective in writing Power Shift was to chronicle how a political movement in Los Angeles had a profound and transformative impact in both California as well as the nation. At its heart, Power Shift is a story of the American Dream. While the perspective focuses on Latino politics, it is an American story and echoes the experience of other ethnic groups such as Irish-Americans and Italian-Americans as they rose to prominence in earlier generations of American politics. The book also discusses how this social movement spearheaded critical changes in public health, law enforcement, education, housing, immigration, transportation, and environmental policies. Power Shift will serve as a textbook for high schools, colleges and universities to supplement current teachings in such subjects as American History, Social Studies, Civics and Political Science. The book will be taught at Loyola Marymount University and the University of California, Berkeley beginning this fall. Book signing events are being planned at the California State Capitol, Long Beach, Washington, D.C., Boston, New York, and at colleges and universities including East Los Angeles College, USC, UCLA, Berkeley, Stanford, Cal State Los Angeles, Harvard, and NYU, among others.